Tips when playing grass court tennis. 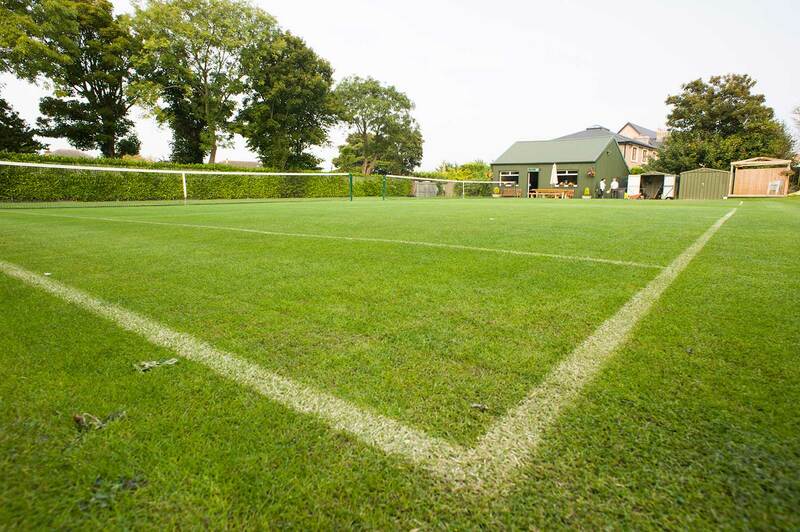 On a fresh, green grass court, the ball tends to bounce fairly consistently, but quite low and fast. On such a fast surface, points tend to be relatively short, therefore, a grass court generally provides the least exercise per match. Unpredictable bounces also introduce more luck into the game. The potency of aggressive shots is enhanced on grass and the ability to rely on steadiness is diminished. Topspin is a major tool for consistency, but it’s less effective and more difficult to execute when the ball bounces low and more difficult to time when the ball bounces unpredictably. On a more positive note, the softness of grass makes it relatively easy on the legs, and its shorter points mean less running. Low bounces make getting under the ball to hit topspin passing shots more difficult, and unpredictable bounces add an incentive to hit the ball in the air, therefore, volleying becomes especially advantageous. Slice groundstrokes are also rewarded on grass, as it enhances their low bounces. Playing on grass thus encourages a versatile, all-court game. Balls and tennis shoes last longer on grass surfaces!